NEXT | Which micro-holiday is your favorite and why do you like it? Hearthstone’s Rise of Shadows, the first expansion in the Year of the Dragon, releases today roughly two hours after this post goes live — that’s Queue o’clock, for you Blizzard Watchers. The fiendish crew of Dr. Boom, Arch Thief Rafaam, Togwaggle, Hagatha the Witch, and Madame Lazul descend upon the peaceful city of Dalaran ready to do E.V.I.L. If you’re interested in the official patch notes, get them right here, hot off the presses. We’re also celebrating with a live stream later tonight, starting at 8:30 p.m. CST on the official Blizzard Watch Twitch channel. Between my preorder and the gold I’ve saved, I’ve got 110 packs to open. After we open packs, I’ll build some decks and venture forth into the new expansion. When can you start playing? 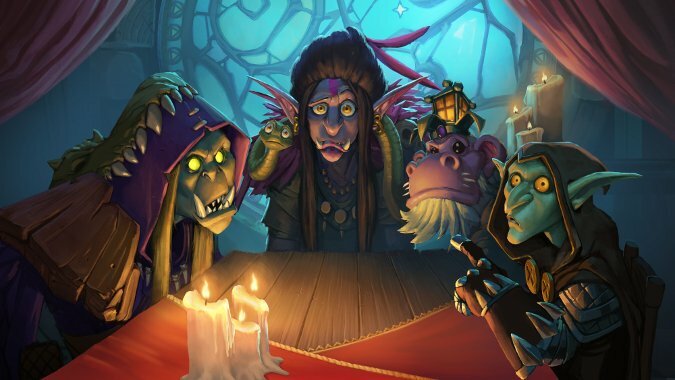 Hearthstone’s official account tweeted out the official release schedule yesterday. At 10:00 a.m. PDT, you can open all the Rise of Shadows packs you’ve already ordered. If you’re like me, you can start buying the packs with the in game gold you’ve been saving. You can actually already open the preorder packs if you participate in a Fireside Gathering, too. 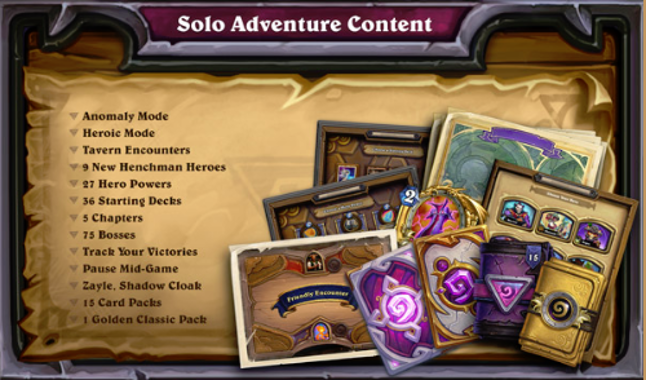 As of today, you can no longer play cards from Journey to Un’Goro, Knights of the Frozen Throne, and Kobolds and Catacombs in the Standard format. Death Knights, Quests and Weapons are relegated to the Wild format along with every card ever released. Over 350 cards are leaving, and Rise of Shadows only adds back about 120. Luckily, the Hearthstone team is going to give you a few freebies to replace what you might have lost. With past expansions, Hearthstone gave players free packs and cards and it looks like they are using the same model in Rise of Shadows. The team has already given everyone who logs in the free Legendary card, Archmage Vargoth. Our friends over at Hearthpwn datamined a series of quests to reward players with free Rise of Shadows packs. The chain awards a total of twelve packs over the course of five quests. Only one requires you to win a game, the rest only require you to play or draw cards. Hearthstone guarantees a Legendary card in your first ten card packs of a new expansion which means each player should start with two free Legendary cards: Archmage Vargoth and a random one from the packs. The quests are datamined and not officially announced so there’s a chance this could change, but its in line with the rewards of previous expansions. In addition to the cards, when you log in, you’ll receive a special card back based upon the device you’re using. There’s a different one for Android, Apple mobile, and Battle.net. You can collect all three. However, not everything for Rise of Shadows is launching today. All of the single player content, which we still don’t have many details for, will release in May. Each ‘wing’ or chapter will cost 700 gold so you’ll need to decide how much gold to save. When you complete the ‘wing’, you’re awarded three card packs for Rise of Shadows.